SIM2K is a Managed Service Provider based in Indianapolis. SIM2K’s team of ten provides IT Consulting Services and helps organizations master complex business and technology issues. They primarily serve small to medium-size businesses and organizations in the midwest. Public libraries are often the heart of a community, offering so much more than “just” books, and this is especially true of the Plainfield-Guilford Township Public Library (PGTPL). Founded in 1901 by a small group of private citizens, the library is a hub of culture, information, and life-long learning. Managed Service Provider SIM2K is pleased to serve a client so vital to the community. SIM2K was already managing the library’s computers, servers, and data backup when they were tasked with an exciting new project: bringing free Wi-Fi to library patrons. In this day and age Wi-Fi is standard in many public places, so the library staff was eager to provide their visitors with free Wi-Fi – to maximize community engagement and learning potential. The library’s events calendar is chock full of a wide range of activities and events. Visitors can participate in everything from Storytime for children and Book Club for adults to card games for Seniors. The PGTPL also offers tech help, knitting, genealogy, yoga, and crafts classes. Big events like lunches, fundraisers, an Arts Gala, medical clinics and Back to School Parties draw large groups of people, so strong network performance and multiuser capacity are essential. As you may have guessed, the PGTPL building is sizable, with the first and second floors totaling nearly 87,000 square feet! The size, combined with the high, cathedral-like ceilings made affordable network design a challenge to the library. “We needed a solution with powerful radios that could be managed centrally, and could service hundreds of patrons every day,” said Chris Kukelka, the SIM2K Technician who spearheaded the project. The previous network couldn’t provide the desired Public Library WiFi and was limiting other educational opportunities the library wanted to offer the public – like live-streamed events. Staff members also wanted to be able to track unique visitors to the network. Luckily, EnGenius is SIM2K’s preferred product and is what they recommend on all their proposals. The strength of EnGenius Access Points meant fewer devices would be deployed. 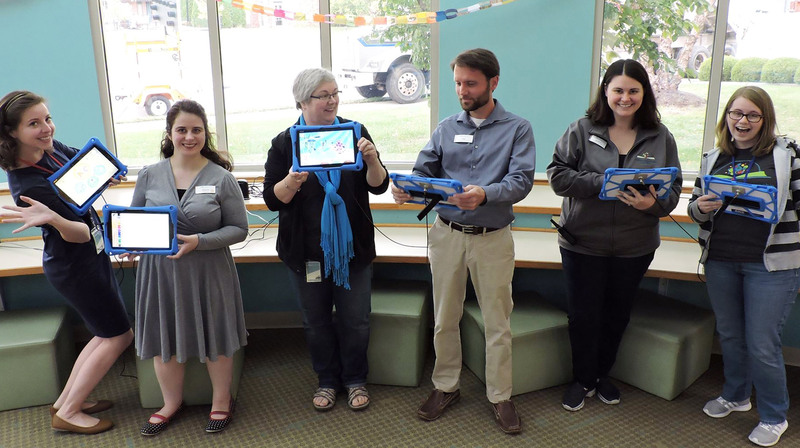 That, combined with the affordable price per device, made deployment at the Plainfield-Guilford Township Public Library a go. SIM2K deployed 15 access points and one 24-port switch to cover the PGTPL facility. They selected an indoor, managed ceiling-mount access point: the EWS350AP. Featuring fast 11ac speeds, band steering, and PoE compliant ports for flexible placement, the EWS350AP is ideal for the library environment. SIM2K created heat maps of the new network’s coverage after they installed the devices and were very happy with the coverage – both with how far it went and how many clients can be supported by each device. This saved the library money, because “An AP brand with lesser radio strength would result in more devices being provisioned to cover the same area, making the project less affordable to the client,” said Tom McShane, Marketing Director at SIM2K. SIM2K had many reasons for making EnGenius their preferred brand, including scalability. “We’re able to install one or two access points at one organization, but we can also create a large network at a place like the library where we have fifteen access points – or at a local outdoor mall where we have an even bigger network deployed,” stated Tom McShane. Bring excellence and affordability to your clients – make EnGenius your preferred brand today!